LB - 6-0 - 230 lbs. - Fr. Note: High school coach was Mike Palmieri ... Was recruited by Reuben Wright. Prior to Western Carolina: Listed as a two-star recruit from Rivals.com ... Versatile player that can play in the backfield or in the slot on offense, as well as in the return game on special teams ... One of the top rushers in the state of Georgia in 2016, finishing with over 2,300 yards and 15 touchdowns on the ground as a junior ... Two-time All-Region team for 5-AA selection as a junior and senior ... Was tabbed as the 5-AA Offensive Player of the Year in 2016 ... First team All-State and first team All-Region in Georgia ... Also runs track as a prep. Personal: Is the son of Shameka Stubblefield and Reggie Atkins. Note: High school coach was Pete Wiggins ... Was recruited by Zac Etheridge. TE - 6-3 - 220 lbs. - Fr. Prior to Western Carolina: Was a four-year varsity letter winner and starter ... Caught two passes for 61 yards and a touchdown before an injury cut his senior season short ... Had 15 catches for 172 yards and two touchdowns as a junior, earning honorable mention All-Region accolades ... Two-time Offensive Player of the Week ... Received the Jack Snook Memorial Award at North Forsyth High ... Finished his career with 34 tackles including 24 solo stops with two sacks and a pair of interceptions ... Took part in the Blue-Grey All-American Combine prior to his senior season ... Also plays baseball as a prep where he was the team leader in home runs. Personal: Is the son of Rachael and Brad Bardall ... Has an older brother, Jackson, who plays football as an offensive lineman at Eastern Kentucky. Note: High school coach was Robert Craft ... Was recruited by Pat Mills. S - 6-1 - 195 lbs. - Jr. Prior to Western Carolina: Transferred to WCU from Georgia Military College prior to the spring, 2018 semester ... Over two seasons at GMC, played in 21 games and recorded 68 total tackles including 56 solo stops ... Played in 10 games as a sophomore at Georgia Military College, finishing second on the team with a career-best 49 total tackles including 29 solo stops and a tackle for loss ... Was among the team leaders with three interceptions, returning one 34 yards for a touchdown in a win over Hocking College ... Also added a fumble recovery ... Posted a total of 10 pass break-ups over his two seasons; High School: Tabbed All-Region twice including a first team honor as a senior in 2014 after collecting an honorable mention as a junior ... Was named honorable mention All-Middle Georgia at safety in 2014 ... Also participated in track & field as a prep, going to the 2015 state meet in the triple jump and 300m hurdles while also holding the Rutland HS school-record in both (300m hurdles, 39.55 & triple jump, 47'7"). Note: High school coach was George Collins ... Was recruited by Blake Gideon and John Wiley. OL - 6-4 - 240 lbs. - Fr. Prior to Western Carolina: Two-year varsity letter winner ... Credited with 72 career tackles including 46 as a senior ... Credited with 20 career tackles for loss including nine sacks ... Added four receptions for 48 yards and a touchdown as a senior ... Name first team All-Marshall County and earned all-region plaudits ... Earned Zaxby's Player of the Game eight times during his junior and senior years including five times in his final season. Personal: Full name is Matthew Garrett Bowman ... Is the son of Lisa and Joel Bowman ... Has two younger siblings, John Brady and Drew. Note: High school coach was Adam Gilbert ... Was recruited by John Holt. TE - 6-6 - 210 lbs. - Fr. Prior to Western Carolina: Credited with three catches for 41 receiving yards and two touchdowns as a senior ... Also recorded a pair of interceptions and three blocked kicks - two punts and a field goal - defensively ... Helped guide his team to the North Carolina 1-A state championship game in 2017 ... Earned WGBR High School Athlete of the Week honors in November, 2017 ... Also plays both baseball and basketball as a prep. Personal: Full name is Luke Donnell Britt ... Is the son of Suzanne and Ralph Britt ... His father, Ralph, was a tight end at N.C. State and later played in the NFL with the Pittsburgh Steelers (1987). Note: Was recruited by John Holt and Pat Mills. Prior to Western Carolina: Played linebacker and defensive end as a prep, three-year varsity letter winner ... Started working on offense as a senior ... Took part in the Blue-Grey All-American Combine in Richmond, Va., in the summer of 2017 prior to his senior year where he was "without peer" and "nearly stole the show" ... Also played basketball as a prep ... Is expected to be an early enrollee, coming to Cullowhee in January. Note: High school coach was Michael Twichell ... Was recruited by John Wiley. Prior to Western Carolina: Dual-threat QB that is listed as a three-star recruit by both Rivals and 247Sports ... Named Georgia 8-AAAAAA All-Region at QB ... Converted to QB prior to his senior prep season after playing mostly as a wide receiver despite playing the position growing up ... Threw for nearly 2,500 yards and 15 touchdowns while adding 800 yards and 13 TDs on the ground as a senior, averaging 329.5 yards per game in his final year as a prep. Personal: Is the son of Aviean and Felicia Curry. Note: High school coach was Benji Harrison ... Was recruited by Brad Glenn and John Holt. DB - 5-9 -165 lbs. - Fr. Prior to Western Carolina: Was a four-year varsity letter winner ... Was a two-time All-Region selec-tion, collecting first team All-Region 5-6A plaudits following his senior year and honorable men-tion as a junior ... Finished with 34 tackles as a senior including 24 solo stops ... Recorded one intercep-tion and nine pass break-ups in his final year as a prep, adding a fumble recovery ... Also tallied 49 all-purpose yards on kickoff and punt returns ... Listed as a two-star recruit by both Rivals.com and 247Sports.com. Personal: Full name is Charles Amil Gadie ... Is the son of Chucquel Davis and Gerald Gadie ... Is one of six children: Jerry, Paris, Page, Chloe, Amir and Amar ... Is originally from Detroit, Mich. Note: High school head coach was Johnny White ... Was recruited by Blake Gideon. DL - 6-4 - 270 lbs. - Fr. Prior to Western Carolina: Was a four-year varsity letter winner along the defensive line ... Selected to the 2017 Shrine Bowl of the Carolinas - the first player from Berea High to earn the honor since 1995 ... Named to the Palmetto Champions Team as the Class 3A Upper State Lineman as picked by the South Carolina Football Coaches Association (SCFCA) ... Also played basketball as a prep. Personal: Full name is Adam Rashad Henderson ... Is the son of Janet Henderson. Note: High school coach was Wayne Green ... Was recruited by Reuben Wright. DB - 5-10 - 170 lbs. - Fr. Prior to Western Carolina: Was a two-way athlete at Harrisburg High ... Was a first team defensive back on the All-State postseason team ... Selected first-team PennLive defensive all-star, finishing with 27 tackles and five interceptions in the secondary ... Listed as the No. 9 corner back in Pennsylvania's 2018 recruiting class by Penn Preps through 247Sports ... Caught 21 passes for 385 yards and a touchdown on offense as a senior and had 22 receptions for 287 yards and three scores as a junior ... Also wrestled as a prep. Personal: Full name is Ronald Lewis Kent Jr. ... Is the son of Ronald Kent Sr. Note: Was recruited by Blake Gideon. K - 5-9 - 160 lbs. - Fr. Prior to Western Carolina: Connected on 13-of-20 field goals as a senior including a career-long 51-yard field goal in 2017, adding 31 touchbacks on kickoffs ... As a junior, connected on 44-of-45 PATs and was 14-of-20 on field goals including a long kick of 47-yards in a game as a part of earning the Cape Fear Valley Conference Special Teams Player of the Year ... Connected on a 60-yard field goal at practice in Twitter post that went viral ... Received the Tom Suiter Extra Effort Award from WRAL-TV in Raleigh ... Is bi-lingual and the leader of this school's Spanish Club ... Also played baseball as a prep. Personal: Full name is Richard Larry McCollum ... Is the son of Carolina and Fredy McCollum ... Has two brothers, Freddy and Bryan ... His older brother, Freddy, kicked collegiately at Wingate. Note: High school coach was Joe Allison ... Was recruited by Pat Mills. OL - 6-4 - 245 lbs. - Fr. Prior to Western Carolina: Was a two-time Northwestern 3A/4A Conference selection - once along the offensive line as a junior and along the defensive line as a senior ... Was a part of a Watauga High offense that averaged 331.6 yards per game with 74 touchdowns scored while blocking for a pair of 1,000-yard rushers in 2017 ... On defense, recorded 44 tackles including 10.5 for loss with a pair of sacks ... Also played basketball as a prep. Personal: Full name is Alexander Raven McConnell ... Is the son of Kim and Jim McConnell ... Is a first generation college student in his family. Note: High school coach was Ryan Habich ... Was recruited by John Wiley. DL - 6-4 - 240 lbs. - Fr. Prior to Western Carolina: Starting his prep career on junior varsity, played on the varsity roster all four years ... Recorded 66 total tackles including 32 solo stops with a sack as a senior, earning him 2-AAAAAA First Team Defense plaudits ... Had a fumble recovery and returned an interception for a touchdown ... Was selected to the 2018 Blitz Border Bowl and the 2018 "War of the Border" High School All-Star football game ... Earned the football "Captain's Award" ... Posted the highest grade point average on the team and saw time at tight end as a sophomore ... Joined the National Honor Society as a junior ... Also participated in track & field as a prep, placing third in the shot put, and was a four-year letter winner in varsity boys basketball as a center and power forward. Personal: Full name is Willie Keith Milner Jr., but goes by K.J. ... Is the son of Francesca and Willie Keith Milner Sr. ... Was born in Wurzburg, Germany ... Has three younger siblings, Andre, Trey, and Xavier ... His father owns a music store and his mother is a United States soldier. Note: High school coach was Ross Couch ... Was recruited by Tyler Carlton and Mark Rhea. WR - 5-9 - 170 lbs. - R-Jr. Prior to Western Carolina: Transferred to WCU from Charlotte prior to the spring, 2018 semester ... Signed at Charlotte as part of the 49ers fourth signing class in 2015 ... Redshirted as a true freshman in 2015 ... Played in 24 games over two seasons at Charlotte, recording 22 receptions for 146 yards ... Additionally saw time on special teams, returning three kickoffs for an average of 23.3 yards per return ... Was also the primary punt returner in 2017, tallying 81 yards on 16 returns in his second season; High School: Was listed as a two-star recruit out of high school by both ESPN.com and Rivals.com ... Selected to the 2014 Shrine Bowl of the Carolinas, the first player to ever do so from his high school ... Was a three-time all-conference selection, twice earning Special Teams Player of the Year plaudits in addition to All-State honors ... Finished his prep career as HRHS's single-season and career record holder for all-purpose yards, touchdowns, punt and kickoff return touchdowns, receiving yards and receiving touchdowns. Personal: Is the son of Andrea and Jeff Mullen ... Has two sisters, Rami and Maggie ... Comes from a football family as his father, Jeff, was the former offensive coordinator and QB coach at Charlotte with previous coaching stops at Ohio, Wake Forest, and West Virginia with his first collegiate stop at Hawai'i as a graduate assistant ... Jeff was also a 1989 All-America selection at defensive back at Wittenberg Univ., in Ohio. Note: High school coach was Marty Paxton ... Was recruited by Reuben Wright. DL - 6-2 - 270 lbs. - Fr. Prior to Western Carolina: Was a two-time, second team all-conference selection as a two-year varsity letter winner ... Recorded 108 career tackles including 69 solo stops with 10 career sacks ... Was a second team All-Eastern Cincinnati Conference selection as a junior ... Was also on the bowling team and participated in track & field as a prep. Personal: Is the son of Tamika and Tony Poole ... Has two siblings, Antonio and Karen. Note: High school coach was Andre Parker ... Was recruited by Mark Rhea. OLB - 6-2 - 220 lbs. - Fr. Prior to Western Carolina: Was a three-year varsity letter winner and a two-time All- I-MECK All-Conference football team selection, earning the recognition following his junior and senior years ... Was a part of the Mallard Creek High North Carolina State Runner-up team. Personal: Full name is Angel Jihad Rivera ... Is the son of Hafitza Johnson ... Has two younger siblings, Aamine Rivera and Najza Johnson ... Originally from Fort Lauderdale, Fla. Note: High school coach was Mike Palmieri ... Was recruited by Reuben Wright and John Wiley. DB - 6-0 - 170 lbs. - Fr. Prior to Western Carolina: Was an all-state, all-area, and all-region 5-A selection as a senior ... Selected to play on the North Team roster in the Touchstone Energy North-South game ... Invited to the Blue-Grey All-American Bowl in 2015. Personal: Full name is Ashton Jermaine Rogers, but prefers to go by A.J. ... Is the son of Lateshia and Ashton Rogers Sr. ... Has four older siblings, two brothers and two sisters. Note: High school coach was Reggie Shaw ... Was recruited by Reuben Wright and Blake Gideon. OL - 6-6 - 275 lbs. - Fr. Prior to Western Carolina: Two-time all-conference selection, earning All-Southeastern 4A Confer-ence (SEC) selection as a junior and an All-Sandhills Athletic Conference (SAC) nod as a senior ... Was named to the WPDE End Zone Team and was selected to play in the Shrine Bowl of the Carolinas fol-lowing his senior season while also collecting 910Prep.com All-State accolades ... Was additionally named to the 2017 American Family Insurance All-USA North Carolina Football Team. Personal: Full name is James Tyler Smith ... Is the son of Betty Jo and Jamie Smith. Note: Was recruited by Pat Mills and John Holt. DL - 6-1 - 315 lbs. - Fr. Personal: Full name is Torrion Jabree Stevenson ... Is the son of Trena Bethea ... Has two siblings, Breyonia and Trinity ... He also serves as a volunteer firefighter in his community, and is a member of the Branchville Christian Church Youth Group. Note: High school coach was Sandy Dukes ... Was recruited by Brad Glenn. Prior to Western Carolina: Listed as a two-star recruit by both Rivals and 247Sports ... Was a listed as a top wide receiver at the Showdown ATL Regional ... Selected as an honorable mention All-Region 8-7A ... Played both WR and CB as a prep. Personal: Is the son of Sonja and Dennis Stribling ... His brother, Channing Stribling, played collegiate football at Michigan and plays for the San Francisco 49ers. Note: High school coach was Christian Hunnicutt ... Was recruited by Tyler Carlton. Prior to Western Carolina: Transfer from Georgia Military where he played two seasons ... In 20 career games, amassed 70 total tackles including 52 solo stops and 12.5 tackles for loss with 3.5 sacks ... Posted 44 tackles as a sophomore with seven tackles for loss ... Had one interception and five pass break-ups. Personal: Full name is Jarquavius Tremontae Wortham ... Is the son of Angela and Alfred Wortham. Note: Was recruited by John Wiley. WR - 6-4 - 185 lbs. - Fr. 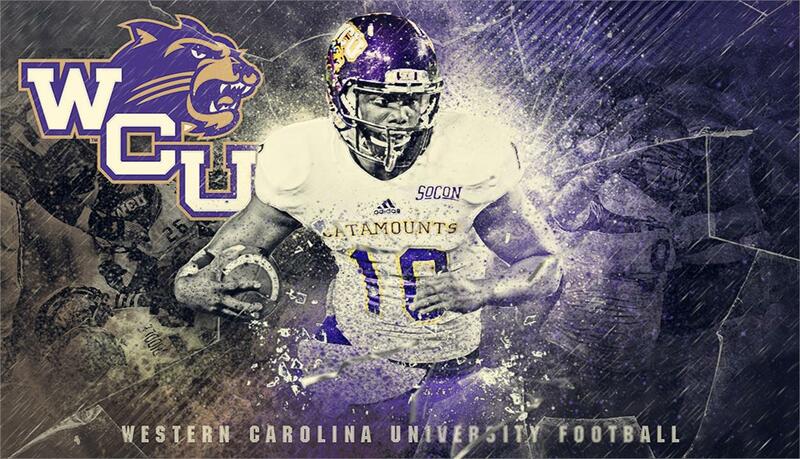 Note: Chose Western Carolina over North Carolina Central ... Was recruited by Jason Nichols. WR - 5-9 - 165 lbs. - Fr. Prior to Western Carolina: Was a three-year letter winner as a kick returner and wide receiver ... Was a two-time first team All-Region selection ... Finished his prep career with 85 receptions for 1,633 yards and 13 touchdowns ... Returned 15 kickoffs for 312 yards, averaging nearly 21 yards per return with one TD ... As a senior, hauled in a career-high 43 passes for 820 yards and seven scores, adding five rushes for 67 yards and a touchdown in earning second team All-Midlands honors ... Received the Bengal Captain and Bengal Wide Receiver Awards as a senior ... High school head coach was Dan Morgan. Personal: Full name is Robert Kenneth Benton, but prefers to go by "Kenny" ... Is the son of Melissa and Robert Benton ... His brother, Timel, plays football as a quarterback at Gallaudet University in Washington, D.C. Note: Chose Western Carolina over Limestone ... Was recruited by Jason Nichols. LB - 6-2 - 210 lbs. - Fr. Prior to Western Carolina: Was named first team defense on the Florida All-State Class 3-A football team following his senior season as he was credited with a career-best 140 tackles including a school-record 100 solo stops and 24 TFLs with 10 sacks ... Forced nine fumbles, recovering three while also intercepting a pass ... Tallahassee, Fla., Quarterback Club named him the 2016 Mickey Andrews Co-Defensive Player of the Year ... Was named All Big Bend in both his junior and senior seasons, collecting second team honors as a junior and first team plaudits as a senior ... Selected to play for the North Team in the 62nd annual North-South All-Star FACA Football Classic ... Recorded 193 career tackles, averaging 9.7 tackles per game ... Posted 14 sacks while also recording an interception and forced a pair of fumbles ... Was listed as a two-star athlete by Scout.com ... High school head coach was Jerod Hickman ... As an all-conference prep wrestler, finished fourth in the state of Florida Class 1-A in the 195 lbs., weight class as a junior and qualified for the state tournament as a sophomore. Personal: Full name is Cameron Michael Brown, prefers to go by "Cam" ... Is the son of Sam and Michelle Brown ... Has two siblings, Bin and Samaya. Note: Chose Western Carolina over Akron, Chattanooga, Kent State, Mercer, North Carolina Central, and UAB ... Was recruited by Mark Rhea and Blake Gideon. OL - 6-2 - 280 lbs. - Fr. Prior to Western Carolina: Three-year varsity letter winner as a center and guard on a three-time region championship squad ... Selected second team All-Gwinnett County as a senior ... Twice named Offensive Lineman of the Week during his career ... Was listed as a two-star athlete by both 247Sports.com and Rivals.com ... High school head coach was Shannon Jarvis ... Was a finalist in the shot put in the Georgia 7-A Track & Field state championship. Personal: Full name is Nicholas Michael Campbell ... Is the son of Sherrie and Mike Campbell ... Was born in Jacksonville, Fla. ... His father played at Auburn University on the 1988 and 1989 SEC Championship teams before playing professionally in the Canadian Football League (CFL) with the Hamilton TigerCats ... Has three siblings; Sabrina, Hannah, and Graham. Note: Chose Western Carolina over Charleston Southern, Georgia Southern, Kentucky Christian, Mercer, and Navy ... Was recruited by Tyler Carlton. LB - 6-1 - 190 lbs. - Fr. Prior to Western Carolina: Three-year letter winner who finished with a school-record 366 career tackles including six sacks, recording 133 stops as a senior ... Also stepped in at running back as a senior, adding over 800 yards rushing and 15 touchdowns on the ground in his final season to earn the Denver Weekly Two-Way Player of the Year honor and All-Gazette accolades ... Collected Southern District-7 all-conference plaudits and SD-7 Defensive Player of the Year honors as a junior after finishing with 123 tackles including a school-record 26 tackles for loss and a career-best five interceptions ... Earned the Newcomer Award on the North Carolina State Championship team as a sophomore ... High school head coach was Mike Byus ... Also played baseball as a prep where he hit .292 with 26 runs scored, 22 RBI, and six extra base hits as a junior, collecting all-conference accolades. Note: Chose Western Carolina over Charlotte, Charleston Southern, Elon, Furman, Gardner-Webb and Liberty ... Was recruited by John Holt. Prior to Western Carolina: Played for head coach Jason Dawson at John Champe HS in Aldie, Va., before finishing his prep career at Fork Union Military where he played for head coach Col. John Shuman ... At John Champe HS, garnered first team all-conference and second team All-Region honors as a senior as a part of a conference championship team in just the Knights' fourth year of existence ... Garnered MaxPreps Offensive Player of the Game accolades in a game against Dominion (Oct. 16, 2015) ... Recorded 35 catches for over 400 yards and four touchdowns in his final season ... Also played basketball at John Champe HS. Personal: Full name is Owen Mattingly Cosenke ... Is the son of Kelly and Stephen Cosenke. Note: Chose Western Carolina over Lafayette ... Was recruited by John Holt. LB - 6-1 - 205 lbs. - Fr. Prior to Western Carolina: Was a part of two high school state championships as a sophomore and junior ... Earned first team all-region plaudits as a senior, posting 89 total tackles including 68 solo stops with five sacks ... High school head coach was Rush Propst. Personal: Full name is Dankerious Willie Debruce, but prefers to go by "Willie" ... Is the son of Willie and Lillian Debruce. Note: Chose Western Carolina over Chattanooga and Troy ... Was recruited by Zac Etheridge. DL - 6-0 - 255 lbs. - Fr. Prior to Western Carolina: Three-year varsity letter winner ... Finished with 116 career tackles including 90 solo stops and 26 tackle assists ... Was a two-time All-MEKA 4-A Conference selection and twice dubbed the school's Most Outstanding Defensive Lineman ... Led his team in sacks in both his junior and senior seasons ... Collected All-Observer defensive honors as a senior ... High school head coach was Mike Newsome ... Was in the Beta Club for three years. Personal: Full name is Elijah Raekwon Hall ... Is the son of Marlon Hall and Natasha McCauley ... Has an older sister who played college basketball. Note: Chose Western Carolina over Gardner-Webb and Presbyterian ... Was recruited by Mark Speir and Jason Nichols. OL - 6-5 - 250 lbs. - Fr. Note: Chose Western Carolina over VMI ... Was recruited by John Holt. LB - 6-2 - 225 lbs. - Fr. Prior to Western Carolina: Over his four-year prep career, recorded 458 career tackles including 200 solo stops and 29 sacks ... Was a three-year all-region selection ... Named the 5-A Defensive Player of the Year as a senior after collecting a career-high 130 season tackles ... Was an honorable mention Class A-Private All-State selection ... Credited with the most tackles by a freshman in his first year as a prep ... High school head coach was Wayne Dabbs ... Was an honor roll student and was selected to the Dean's List as a senior ... Also participated in field events, setting a school-record and finishing fourth in the state in the discus as a junior. Personal: Full name is Alan Micah Harris ... Is the son of Daisy and Andre' Harris ... Has two siblings. Note: Chose Western Carolina over Tusculum, Pikeville, Chattanooga, and Samford ... Was recruited by John Wiley and Blake Gideon. K - 5-10 - 165 lbs. - Fr. Prior to Western Carolina: Named first team placekicker on the Georgia 3-AAAAAAA All-Region team ... According to ProKicker.com rankings, was the No. 3 kicker overall and No. 9 kickoff specialist in the country ... Earned a four and a half star rating from Chris Sailer kicking ... Rated as the nation's top kicker by Ray Guy ProKicker.com Camps ... As a junior, was an honorable mention on the Georgia Class AAAAAA All-State team as a kicker ... High school head coach was Shane Queen. Personal: Full name is William Archer Horton ... Is the son of Bucky and Kara Horton ... His father is the principal at North Cobb HS. Note: Chose Western Carolina over Elon and Missouri ... Was recruited by Pat Mills. DB - 5-11 - 175 lbs. - Fr. Prior to Western Carolina: Collected first team All-Region honors for 2-AAAAAAA honors ... Was also named to the 2016 Newnan Times-Herald All-County football team on the first team defense ... High school head coach was Steve Pardue ... Also ran track as a prep. Personal: Full name is Reginald Johnathan Jones ... Is the son of Reggie Jones Sr. and Chassity Anthony. Note: Chose Western Carolina over Charleston Southern and Jacksonville State ... Was recruited by Zac Etheridge and Blake Gideon. QB - 6-4 - 200 - Fr. Prior to Western Carolina: Was a three-year starter at quarterback at Page HS, taking over as a sophomore after an injury to the season starter ... As a senior, was named the Guilford County Football All-Stars co-Offensive Player of the Year ... Was also selected HSXtra All-Area first team ... Guided Page HS to the North Carolina 4-A state championship game in back-to-back seasons as both a junior and senior ... In his final season as a prep, completed 206-of-368 (56%) for 3,109 yards and 38 touchdowns, adding 599 yards on the ground on 97 carries and 11 TDs ... Selected to play in the 80th annual Shrine Bowl of the Carolinas ... For his career, amassed 6,603 yards on 439-of-772 passing for 72 touchdowns while also rushing for 854 yards on 195 and 22 TDs ... Was listed as a two-star athlete by both 247Sports.com and Scout.com ... High school head coach was Kevin Gillespie ... Also played basketball as a prep, helping the Pirates to the NCHSAA Class 4-A regional semifinals. Personal: Full name is Will Carlyle Jones ... Is the son of Bill and Kari Jones. Note: Chose Western Carolina over Elon, ETSU, Gardner-Webb, and Towson ... Was recruited by Brad Glenn. DL - 6-2 - 250 lbs. - Jr. Prior to Western Carolina: Transferred to WCU from the University of Louisiana at Monroe (ULM) ... Redshirted as a true freshman in 2015 ... Played in nine games as a redshirt freshman in 2016 recording five tackles including one solo stop; At Notre Dame HS: Earned first team All-Parish, first team All-District, first team All-Acadiana, first team All-State, and first team Coach's All-State as a junior in 2013 ... Tallied 65 tackles as a senior in 2014, including 22 tackles for loss, 14 sacks, and 30 QB hurries ... Earned Defensive MVP honors on both the All-Parish and All-District teams ... Was again named first team All-Acadiana and first team All-State in 2014 ... Selected to play in the 2014 LHSA East-West All-Star Game, collecting MVP honors ... Was a two-star recruit out of high school by both Scout.com and 247Sports.com ... High school head coach was Lewis Cook. Personal: Personal: Full name is Nathaniel Joseph Link ... Is the son of Kerry and Jeanette Link ... Has three siblings; brother Jackson and two sisters, Amalie and Helen. Note: Chose Western Carolina over Montana ... Was recruited by Mark Rhea. DL - 6-2 - 285 lbs. - Fr. Prior to Western Carolina: Was a part of the Alabama State 7-A high school football championship team as a senior, collecting one of Hoover High's nine sacks in the title game ... Selected to the "Over the Mountain Journal" All-OTM football team ... High school head coach was Josh Niblett. Personal: Full name is Ricardo A. Palao ... Is the son of Ricardo Palao, Sr., and Neisha Glapion. Note: Chose Western Carolina over Alabama A&M, Central Arkansas, Robert Morris, Tennessee-Martin, and Tennessee Tech ... Was recruited by Blake Gideon and Zac Etheridge. WR - 6-0 - 180 lbs. - Fr. Note: Chose Western Carolina over Elon and Georgia State ... Was recruited by John Holt. DB - 5-11 - 170 lbs. - Fr. Prior to Western Carolina: Was a part of three Region 8 championships and the 7A state championship as a senior ... Named All-County in his final season as a prep ... High school head coach was Jeff Herron ... Also ran track and participated in the long jump as a prep. Personal: Full name is Quintin Jimani Thames ... Is the son of Enicka Harden, and Jihad Yusef and Tiffany Huey ... Was born in St. Louis, Mo. ... Has six siblings: Kita, Chelsea, Kealon, Amaris, Justin, and Autumn. Note: Chose Western Carolina over Carson-Newman, Elon, ETSU, and Savannah State ... Was recruited by Tyler Carlton and Blake Gideon. OL - 6-4 - 285 lbs. - Fr. Prior to Western Carolina: Named to the first team All-USA South Carolina football team and to the Herald-Journal All-Area team ... Selected to play in the 80th annual Shrine Bowl of the Carolinas ... High school head coach was Chris Miller ... According to SCMat.com, listed as the No. 5 wrestler in the state of South Carolina at the 5-A classification ... He also won the county championship in wrestling in 2017. Personal: Full name is Grady Maguire Thomas ... Is the son of Tammy Thomas ... Is originally from Laconia, N.H. Note: Chose Western Carolina over Elon and Wofford ... Was recruited by Mark Rhea. QB - 6-3 - 185 lbs. - Fr. Note: Chose Western Carolina over Cornell and Samford ... Was recruited by Blake Gideon and Brad Glenn. OL - 6-7 - 295 lbs. - Fr. Prior to Western Carolina: Played offensive tackle and was a team captain as a senior at Roger Bacon HS ... Selected first team All-Greater Catholic (GCL) Central lineman ... Awarded his team's Most Valuable Player honor along the offensive line ... Also received Academic All-Ohio honors in his final year as a prep ... Earned second team All- GCL Coed Central lineman in 2015 as a junior while also receiving the most improved team award ... High school head coach was Mike Blaut. Personal: Full name is Clark Evan Willhoite ... Is the son of Sonya Beeler and Mark Willhoite ... His mother played basketball at Bradley University ... Has a brother, Hagan, and a sister, Zoey. Note: Chose Western Carolina over Ashland, Charleston University, Sioux Falls, Eastern Kentucky, and Georgia State ... Was recruited by Mark Rhea. LB - 6-3 - 220 lbs. - Jr. Note: Chose Western Carolina over Presbyterian ... Was recruited by Zac Etheridge and Mark Speir.